Database Setup Wizard. 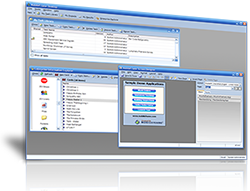 This wizard helps users quickly and easily create a new MobileFrame database and set it up for use. It will work with any/all databases supported by MobileFrame including SQL, Oracle and DB2 databases. Task Version History. When you save a task (a mobile application), an automatic backup of that version will be generated and stored in the database. You can review all versions of your tasks, rollback to a particular version, or export different versions of your task. Mobile Work Order / Dispatch System – Created in 1.5 hours by Me! Here’s round 2 on creating a mobile application and this time instead of a real time meal order taking application, I’ve created a simple Work Order System that includes a Dispatch app and a handheld app. They were both built using MobileFrame and completed in under 2 hours. I received an email last week from one of our international partners that included a video of an HTC device running MobileFrame 4.6 (beta) on the Windows Mobile 6.5 OS. Although unconfirmed by MobileFrame Engineering (since we can’t seem to get our hands on a WinMo 6.5 device), the video shows that it’s working great. We didn’t anticipate any issues but it’s nice to see confirmation nonetheless. Thanks to Xenacom (www.xenacom.com) for sending us their findings!